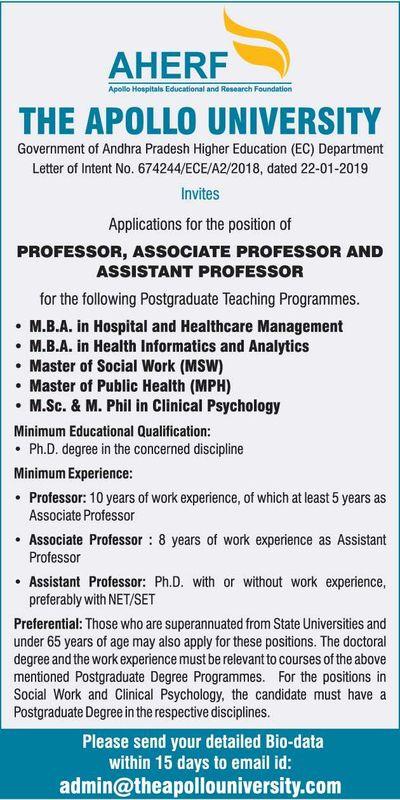 The Apollo University, Chittoor has advertised in THE HINDU newspaper for recruitment of Professor / Associate Professor / Assistant Professor jobs vacancies. Interested and eligible job aspirants are requested to apply within 15 days from 17th April 2019. Check out further more details below. About University: There is a huge emphasis on skills development across a number of sectors including health care following a mandateby the Ministry of Skills Development and Entrepreneurship. All health professionals require to develop professional competence in not just clinical management, but also team-work, communication skills, professional behavior and clinical decision making. These skills enable health care professionals to ensure optimal patient safety and care in all types of healthcare settings. Ph.D Degree in respective disciplines. How to Apply: Interested and eligible candidates are requested to send application along with CV, copies of certificates, copy of PAN card, copy of Aadhaar card and recent passport size photo to the email address given below.